The Emma Maersk was dethroned as the world's largest seafaring vessel this morning when this ship, longer than the Empire State Building, left its dry dock in South Korea for the first time. But this town-sized ship isn't so much built for sailing as it is for pumping gas. 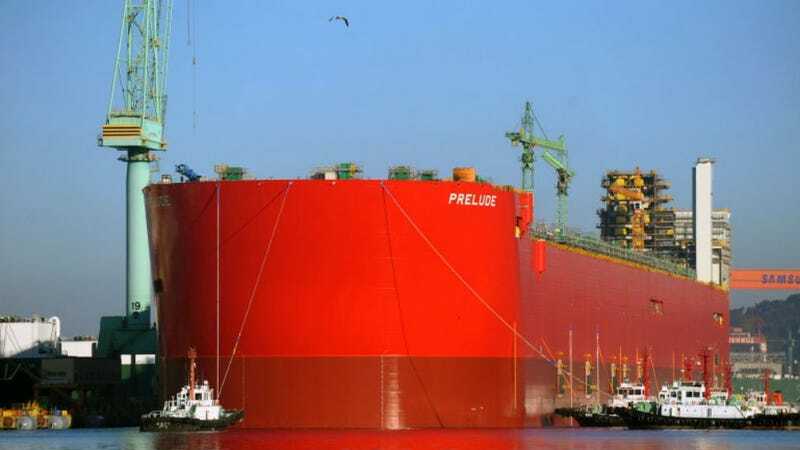 Dubbed the Prelude, the ship will soon be headed to an off-shore natural gas field near Broome, Western Australia where it will serve as Shell's floating liquefied natural gas (FLNG) facility for the next quarter century. Measuring 1,601 feet long, 243 feet wide, and weighing 600,000 tons, this fuel processing ship will also be the largest such floating refining facility on Earth when it's completed in 2017. The FLING is a one-stop shop for liquid natural gas production. Not only does the ship siphon the raw gas from the bowels of the Earth, it refines the stuff onboard and then distributes it to transport ships which ferry it ashore. Every year for the next 25, the Prelude is expected to produce around 3.9 million tons of the stuff. Since summer in Western Australia (November through April) is also cyclone season, the Prelude is designed to withstand up to Category 5 storms without breaking free from her moorings. Connected to the seafloor by four sets of mooring lines running through the 305 foot tall turret, the largest of its kind in the world, the facility can continually turn into the wind with the assistance of three 6,700 HP thrusters to avoid capsizing.